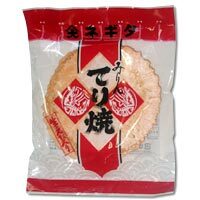 Large round shrimp senbei crackers with a tantalizing baked-in aroma. Their glossy surface speckled with tiny flakes of green laver will remind you of a majestic sunset at the beach. Some people break off and eat little chunks at a time, others gnaw on the whole cracker. Whatever your pleasure, enjoy them as a snack or with beverages.